> Dried Chilies>Guajillo>Dried Guajillo Chile 2 oz. The Guajillo Chile Pepper is the most common chile in Mexico after the Ancho.The Guajillo Chili is a relative of the pulla pepper. They are a little piney and tannic, with a sweet heat. Used in salsas, sauces, soups, and stews. 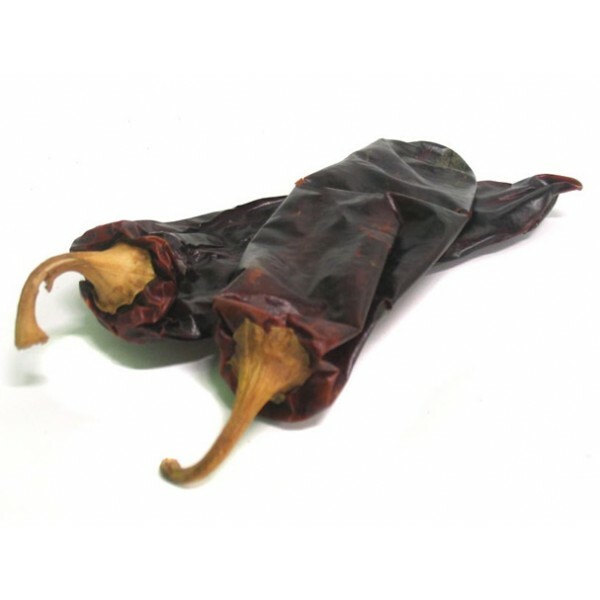 Guajillo chilies are thick brown chiles that contain mild to moderate amounts of heat. Four to six inches long, Guajillos is the dried version of the Mirasol. They have thin flesh and a shiny, deep reddish brown color. Guajillos have a sweet heat, and are tannic with a hint of pine, the Guajillo, pronounced gwah-HEE-yoh, means "little gourd" for the rattling sound the seeds make in the dried pods. Use this chile in salsas, sauces, soups and stews. Guajillo chiles are also used to make Harissa, a hot chile paste mixture used in Tunisian cooking. Guajillo are, like most chiles, high in vitamin C, B vitamins, and minerals. apsicum, the heat ingredient in peppers, raises your metabolism and so helps you burn unwanted pounds. Hot peppers containing capsicum have been proven to help with health problems like arthritis, cardiovascular disease, gastric ulcers, vascular headaches, impotence (resulting from venous insufficiency) infections, kidney trouble, menstrual complaints, respiratory issues like asthma and pleurisy, and thyroid dysfunction and more. Hot chiles like the guajillo have been found to slow the growth of prostate cancers, and also help with pain if applied topically.